An unmanned vehicle carries an injured Marine. Autonomous or driverless vehicles may be a new buzzword within the auto industry, but the technology behind those vehicles isn’t new to Michael Fleming, CEO of TORC Robotics LLC in Blacksburg. The company has been working with the technology since it opened its doors in 2007. Since then the company has been working with the Department of Defense as well as the transportation and mining industries. Fifty percent of its revenue comes from defense projects. The remaining 50 percent is related to commercial customers. “We also work with agriculture, but we focus on the other three [defense, transportation and mining] sectors,” Fleming says. 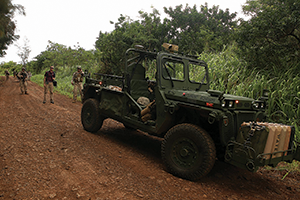 The DoD has used the company’s technology in its military vehicles (humvees and mine-resistant ambush protected vehicles) in Iraq and Afghanistan. The mining industry is implementing the technology in open pit mines that already use autonomous excavators and haul trucks. He says the private company’s revenue has been on an upward swing, although Fleming doesn’t release figures. “Since 2010 we have grown 60 percent each year in revenue,” Fleming says. By 2012, though, that mindset changed because there was international demand, particularly in the military and defense sectors. “We became engaged with the Virginia Economic Development Partnership. We have been working with them for several years now,” says Fleming. The company works with Australia and Singapore but also has customers in Europe. “We are now seeing a demand from South America. We also work with the Middle East through partners,” says Fleming. Most of his customers are fluent in English. “There is not much of a language barrier,” he says. Before doing business in a foreign county, Fleming says, it’s important to research the culture. “You want to become well versed. The most important thing is to be polite and spend more time listening than talking,” says Fleming. Startup businesses in Blacksburg and Montgomery County are on the rise. This spring four local startups in Blacksburg – Fitnet, a mobile fitness app; Heyo, which provides a social marketing platform for small businesses; LawnStarter and VirtualU, which works with 3D scanning and human avatars – secured $4.1 million of angel and venture financing to grow their companies. The Virginia Tech Corporate Research Center, adjacent to Virginia Tech, has grown to more than 150 research, technology and support companies. Local entrepreneurs founded about 60 percent of the companies in the park. Major employers in Blacksburg include Virginia Tech, Dish Network, Moog, which manufactures motion control products, aerospace company Alliant Techsystems and the Montgomery County School Board. Singapore is one of the world’s largest exporters. The country has a large petroleum and petrochemical industry as well as a prominent manufacturing sector that includes digital and electronics manufacturing. Tourism and financial business services also factor in the country’s economy. One of the country’s growing economic sectors is biotechnology. Major employers include Pan Pacific Hotel Groups, Singapore Airlines, Shell Eastern Trading (a supplier of liquified natural gas) and agribusiness group Wilmar International Limited.